Push past your personal boundaries by picking up a new sport, or have a go at a fun try-out as a thriving Sports Hub community! Whether for recreation, leisure or sports, the Experience Sports Programme welcomes you to our big family of sports and fitness maniacs! Check out the variety of programmes in store for you and your family for a ton of sporting fun. This one’s on us! Our Ambassadors are what makes our Experience Sports Programme successful! If you’re brimming with energy and enthusiasm and would love facilitating a smooth delivery of our various activities on offer, we would love for you to join us! Come on down to the EXPERIENCE SPORTS @ SINGAPORE SPORTS HUB now! 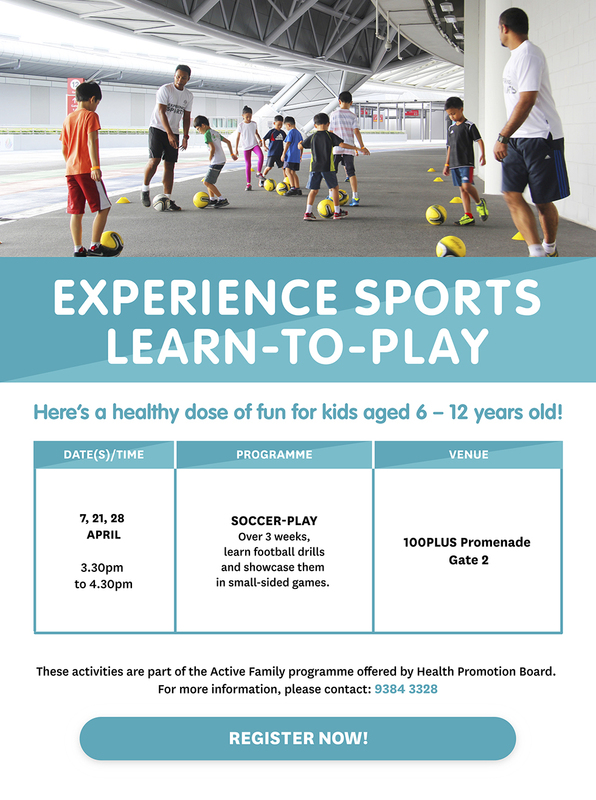 To volunteer for the Experience Sports Programme, please email us at experiencesports@sportshub.com.sg. Looking to have fun while you get in shape? 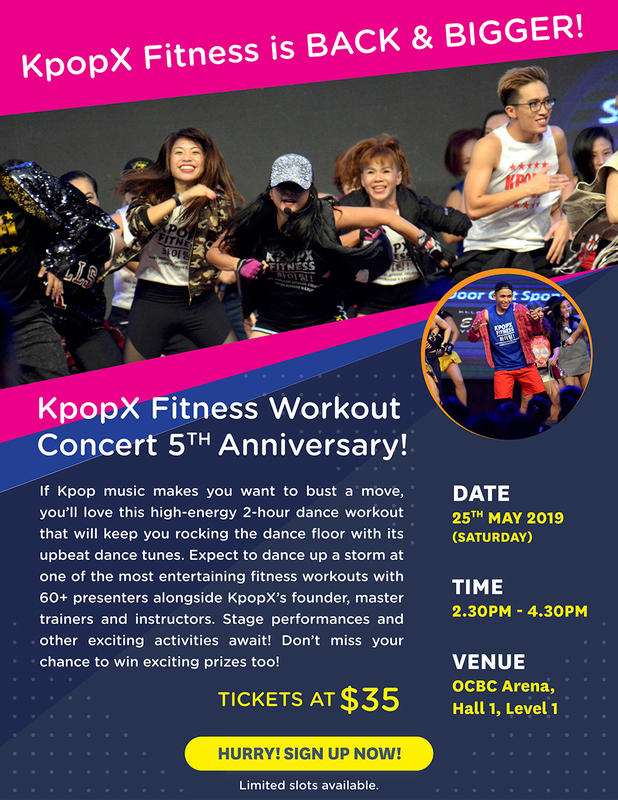 Everything from Yoga to Zumba and Cardio Blast is available for FREE to the public at the Singapore Sports Hub! Get the most out of these sessions with our certified trainers and be rewarded for keeping fit! For more information, please click on the Session Plan above. Please register for Experience Sports FIT-Sessions to get the latest update on venue change and/or cancellation. Terms and Conditions apply. For more information about FIT-Rewards, download the FAQ here. Click here to register for your daily Experience Sports FIT-Sessions now! For more enquiries, email us at experiencesports@sportshub.com.sg. Schedules and programmes are subject to change. 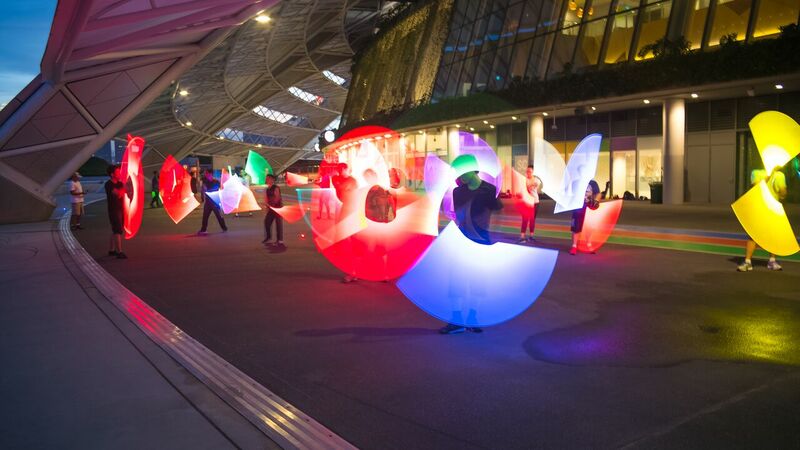 Singapore Sports Hub reserves the right to change, amend or postpone the Experience Sports Programmes without prior notice. Unleash your undiscovered genius as you try out new sports such as handball, beach volleyball and basketball at our FREE Learn-To-Play programme! Register online now to get a taste of the action today! 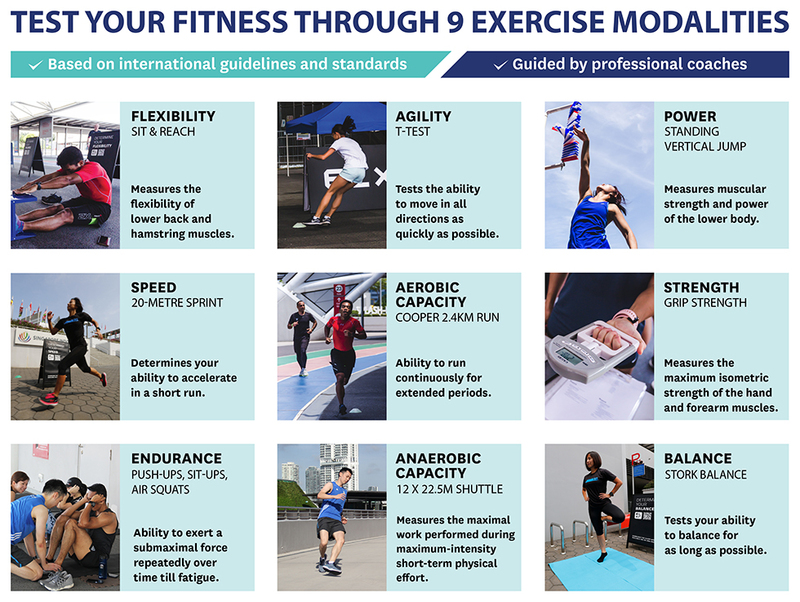 For any enquires regarding Fitness @ Work, please call 9112 3972 or email: fitnessatwork@team-axis.com. Running is no longer just running the same route, same pace, day after day. Join us at the free weekly HPB i-Run to learn more about running and to know yourself better! We aspire to improve your running efficiency, expose running enthusiasts to variety of training protocols and more importantly, to make running FUN! Hesitate no more, put on your running shoes and meet up with other running kakis! See you there! For any enquiries please contact call 8299 1880 or email: enquiry@activglobalfitness.com. For any enquiries and to find out more about their programme here. Looking to improve your health and fitness? 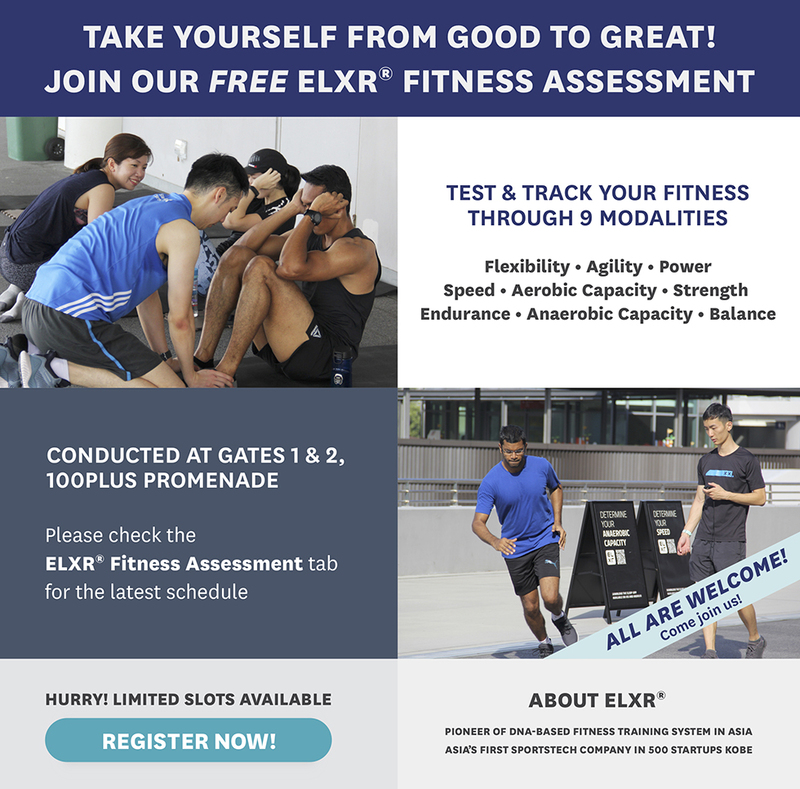 Take yourself to the next level with the free Community Fitness Assessment brought to you by Singapore Sports Hub, in collaboration with ELXR®, created to help you keep track of your fitness progress, raise your game and reach your fitness goals! Take yourself from good to GREAT! Limited slots available, register now to secure a spot! Here at Experience Sports, we’re championing better living through technology. You can do more with the convenient & accessible ELXR® App now such as registering for daily FIT-Sessions, self-track your fitness progress while undergoing ELXR® Fitness Assessment and earn FIT-Rewards points for participating! Download the ELXR® App today. 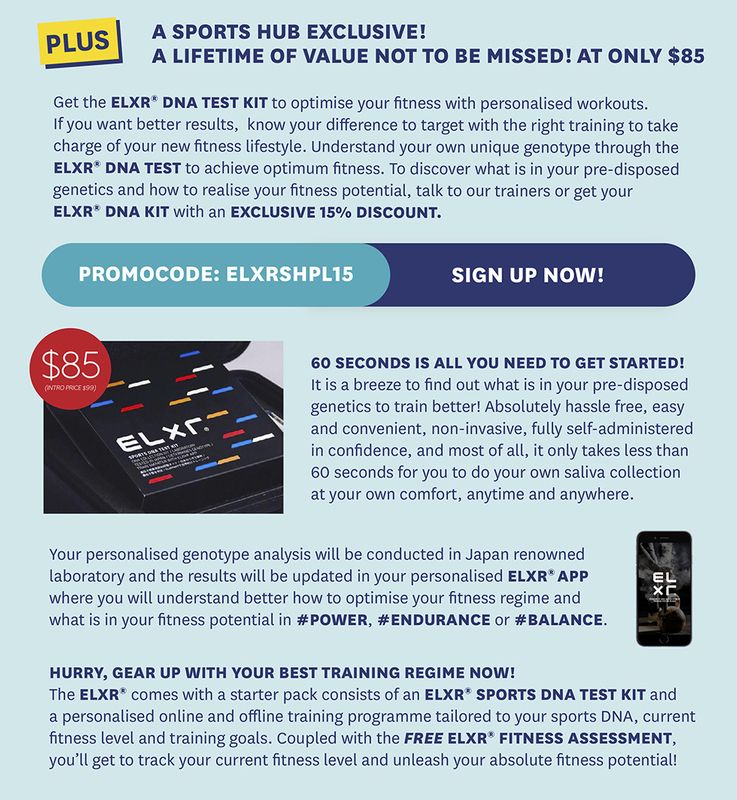 For more information on ELXR® Fitness Assessment, download the FAQ here. 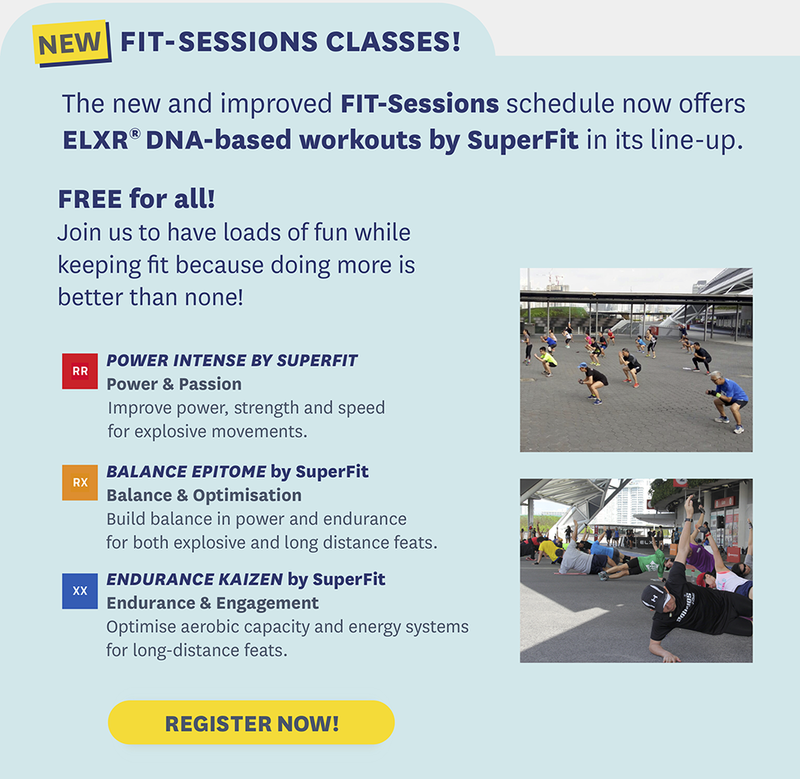 How can I find out more information on the FIT-Sessions? 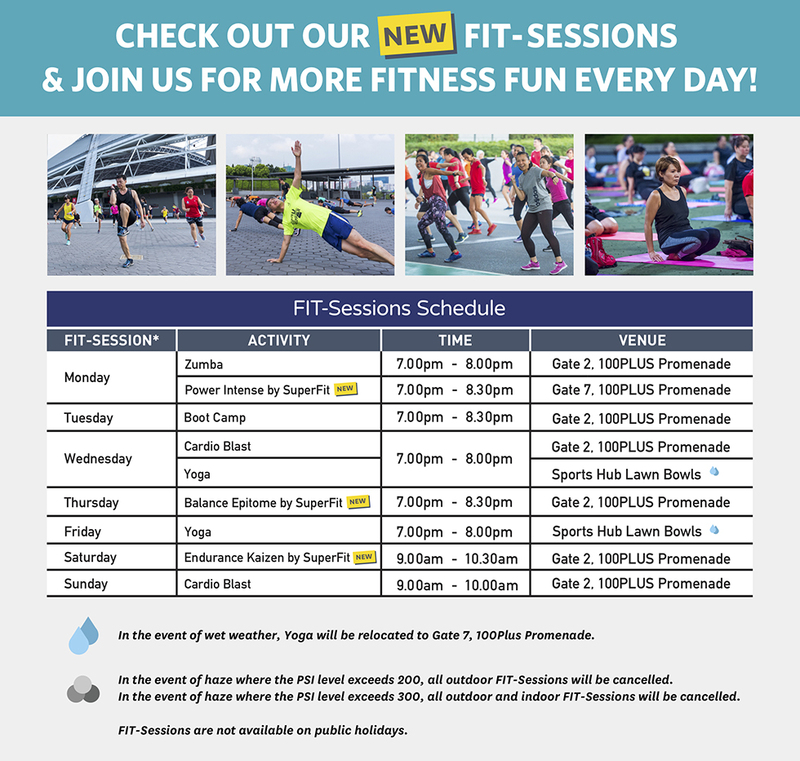 You may refer to this schedule for the details of the Fit-Sessions. I am interested to participate in the FIT-Sessions. What should I do? You are required to register for the programmes through our online booking system. If you are a new user, please be informed that you will need to create an account prior to the registration. We do not accept walk-in registrations and you will need to register for the programmes through our online booking system. Is there a minimum age to participate in the FIT-Sessions? Yes, you will need to be at least 7 years old and above. In the event of inclement weather, what should I do? You are encouraged to check our Facebook page for the latest updates. How do we get a FIT-Sessions Rewards Card? The FIT-Sessions Rewards Card is available during all FIT-Sessions at our Registration Booth. How do I start earning the rewards? Select "FIT-Sessions" followed by "Register Now"
Collect stamps to redeem exclusive premiums and enter lucky draw! How do I redeem the different tier rewards? You may proceed to our Registration booth during any of the FIT-Sessions to redeem the rewards. Rewards are subject to availability and are on first come, first served basis (while stocks last). Rewards may vary and are non-exchangeable for cash or other products. Can I have more than 1 Card? You may hold more than 1 Card. However, stamps are non-transferable and no combination of stamps in more than 1 Card is allowed. 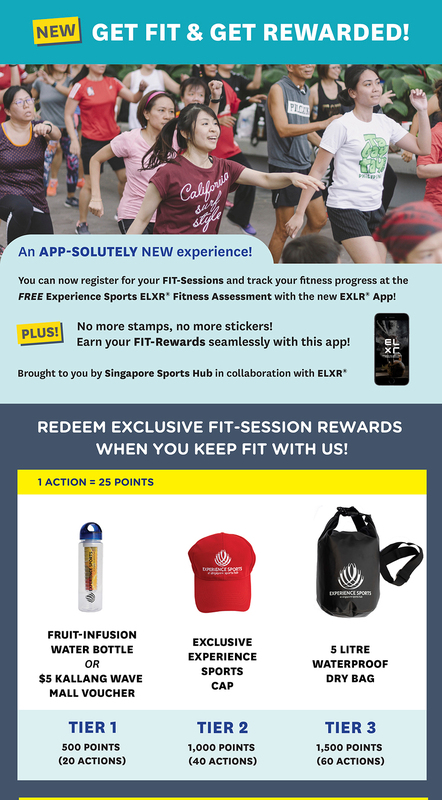 FIT-Sessions Rewards Card must be completed with 35 stamps to be eligible for the exclusive T-shirt and Lucky Draw. Do I have to redeem the reward in order to participate in the Lucky Draw? No, you will be able to participate in the Lucky Draw after you have completed the card by earning 35 stamps. Can I redeem the reward at a later date? All rewards must be redeemed by 30 November 2018. Redemption of the rewards is subject to availability and based on a first come, first served basis (while stocks last). Late redemptions will not be entertained. How will I be informed of the Lucky Draw results? The Lucky Draw will be conducted in December. Winners will be notified via call or email within five (5) working days of the conduct of the Lucky Draw. Please ensure that your Name, Email and Contact Number are clearly stated on the Card. Can I redeem the rewards more than once and/or submit more than 1 Card for the Lucky Draw? You may redeem the rewards more than once and the redemption is subject to availability. You may also submit multiple entries for the Lucky Draw but each participant may only win one (1) prize. How do I get more information regarding the rewards and prizes? Please visit our website at www.sportshub.com.sg/experiencesports or check out our Facebook page for more details and updates. Are there any other terms and conditions for the rewards or Lucky Draw Prizes? Please refer to this link for details of our terms and conditions. Am I qualified to earn a stamp if I register for the FIT-Session only during the FIT-Session? You will only be eligible to earn a stamp when you complete an online registration before the start of the FIT-Session. You must also attend the FIT-Session to earn the stamp. Can I get a replacement Card if I lost or damage my Card? Lost or damaged Card will not be replaced. You may request for a new Card and start earning the stamps again. The stamps earned earlier in the lost or damaged Card are non-transferable to the new Card. Can I earn a stamp if I register for the FIT-Session but I did not attend the FIT-Session? Stamps will only be issued during the FIT-Session to participants who have done an online registration and attended the sessions. Participants are required to check-in at the registration booth to receive the stamp during the FIT-Session. I could not register for the FIT-Session online. What should I do? Please approach our staff at the registration booth during the FIT-Session for assistance. If I forgot to bring to my Card, how can I earn the stamp? You will not be eligible for a stamp if you have forgotten to bring the card. How can I participate in the Lucky Draw? You are required to complete the Card by earning 35 stamps and the completed Card can be submitted at the registration booth before 30 November 2018. All entries must be submitted by the last Fit- Session and entries after 30 November 2018 will not be accepted. You may contact our Customer Care Team at +65 6653 8900. Alternatively, please drop us an email at experiencesports@sportshub.com.sg.